Serenity Now Travel Blog: Day 3- Sharks in the water. This morning I woke up at 3:30am. A step in the right direction, I guess. One hour later than yesterday. 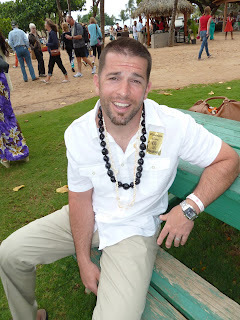 I worked on my blog, then got myself ready to go up to the North Shore for a nice swim with sharks. No big deal. Matt got up and left me to me nerves- it's the best thing to do. Don't try to "calm me", that won't work, just pretend I'm not in the room. Really. So we quietly got ready in a very somber mood. Ha! The captain had told us to give ourselves an hour to get there- so we left at 6:30am. After taking our first step in the lobby my heart sank a bit more. It had obviously just poured. I tried not to panic and figured that it's probably not even raining where we were going. Not so much. We drove the 40 minute ride to the North Shore in on and off pouring rain with ominous black clouds surrounding us. Ugh. It really felt as though we were headed to our very own funeral. I knew that if it was bad weather the water would be even more rough. I had realized that it was around 1pm at home & it was Sunday, so I knew my family was having Sunday dinner together and I need to say my last words, so I called them on the last bit of the drive. I joked with them about how ridiculous my anxiety issues are in that, a year ago today I was headed for my wedding rehearsal and rehearsal dinner and today I was headed to swim with sharks and I was actually more nervous headed to my wedding rehearsal than to swim with giant monsters that want to eat me! Not. Normal. Once we arrived we were greeted by the Captain and Matt's first words to the man was, "Since we're first here can we be first in the water?". God, I love that man... and the captain too because he said, "yes". The weather had also cleared over the water. A bit of clouds, but no rain. So we got ourselves on the boat and we were told another bit of good news, normally there's 19 people on the trip, this trip only 10. Less people, less time on that rough water. Score! So after waiting what felt like an hour for the last guy who was late, we were finally on our way. We found out that we were only headed 3 miles out. Great news. We also got to see a whale far in the distance- well, we saw the water from his blow hole. The water roughness at first didn't seem too bad and really I was feeling pretty good. Next thing I know we're headed to get into the cage. They told us the most dangerous part is getting everyone in and out of the water, they gave us instruction on how to get in and then gave us our snorkels. Matt & I were first with three other young guys. I was last into the cage so I could watch everyone else get in. Finally, it was my turn. I took my first step and was pleasantly surprised at the water temperature. It wasn't as terrible as I feared. Once in the water, they move the boat away from the cage, so you're really floating out in the sea totally surrounded by sharks. I know it's hard to believe but it really didn't feel scary to me at all. I know it should have, but I wasn't scared. There were about 8-10 sharks ranging in size from 5-8 feet long. We were in 450 feet water, surrounded. The sharks just circled us and even swam right below us, but very peacefully. They were within 1-2 feet from us most of the time. At one point one swam right at me, then turning at the last minute and swam by almost touching the cage bars that I was holding. At that moment I got more, not nervous, I'd say "respectful" of what I was doing and backed away from the cage for a bit. Then, I was right back, it was too cool. We were in the water probably 30 minutes and it was awesome. I was so glad I had done it and I rather be in that cage than back on that rocking boat. Once it was time to get back on the boat, they brought the boat back up alongside the cage and secured the cage to the side of the boat so that it would be a little more stable. I was the first out, since I was closest to the ladder. Awesome. Climb up a ladder in your swim suit in front of a bunch of guys. I'll bet none were looking since Matt was right behind me though. Once on the boat it was cold and rocking! I got my towel and then immediately called my mom to let her know I was still alive. Once I got off the phone and was no longer distracted and no longer on an adrenaline rush, I was feeling a little queazy. So I sat huddled up in my towel, clenched jaw, waiting for the next, and only other group, to have their turn. Luckily, for us, they didn't purchase the video so they weren't in the water near as long as we were, so the agony wasn't too prolonged. The ride back I was feeling it, but fighting thru. We made it back to shore by 9:30am, so it wasn't long at all. Perfect amount of time, because I think any longer and I would have been really sick. Out of our group, no one got sick, although there were two girls that had to lay down the whole way there and back because they were really feeling it. Once on shore I slowly started to feel better. Matt was feeling great and was hungry so he made a stop at McDonalds for some apple pies- the real ones! Hawaii is the only US state that still deep-fries their apple pies. Other countries also still deep-fry them because they understand that fast food is not supposed to be healthy. Anyway. I was still too queasy to have anything deep-fried but I was getting better by the minute. The rain started up again on our drive back home. We were supposed to be going on a nice scenic railroad ride thru the Ko Olina resort area, but so far that was not looking promising, but it was still early. So we headed back but first stopping at the Leonard's truck that is close to our resort. We were finally going to try "malasadas"- a Portuguese donut filled with amazingness. We ordered six, 4 custard, 1 chocolate and 1 coconut. I thought they were good, but a little over-hyped, but Matt loved them! They messed up our order and gave us 4 plain, so after going back the let us keep the original 4 and then gave us an additional 4 with custard. Score. We ate them in the parking lot, which is shared with a Kmart and many other stores. We had forgotten to pack Matt's vitamins for his knee and he was having some discomfort so we had been meaning to stop and get them, so it was perfect to be sitting in a Kmart parking lot. As Matt was getting out of the car his knee flared up, I guess that's how to put it. He has had a problem with this knee for a long time and has already had two surgeries. A few months ago we think he aggravated it and so he's had a bit of discomfort on and off for a while. Now it PAIN. We think the Diamond Head hike took it to the next level. He had been okay after Diamond Head and he didn't have any trouble at the later hike by the waterfall, but this afternoon something definitely changed. It was getting worse and worse as he walked so we headed back to our resort. At the resort, we started calling all the local pharmacies looking for crutches. We must have called 12 stores and they either were closed because it was Sunday, sold out of the proper height or didn't sell them. We soon realized that we were going to have to wait until tomorrow when everything was open. So Matt sat on the balcony and iced his knee. It was still raining and the weather report wasn't looking promising. I decided I need some lunch since so far all we've eaten was donuts. Matt didn't want anything, so I headed down. One complaint about Aulani is the walkway to the "fast food" restaurant is not covered. I was going to have to walk in the rain to get my food & then I didn't want to leave Matt long so I was going to carry it back thru the rain to get back to my room. The parking garage is also a walkway outside, uncovered. Bad planning, although supposedly Hawaii only has "passing rain storms". Not so much. So I headed down, but once down there I figured I'd give the front desk a shot and see if they had any ideas about our crutches fiasco. 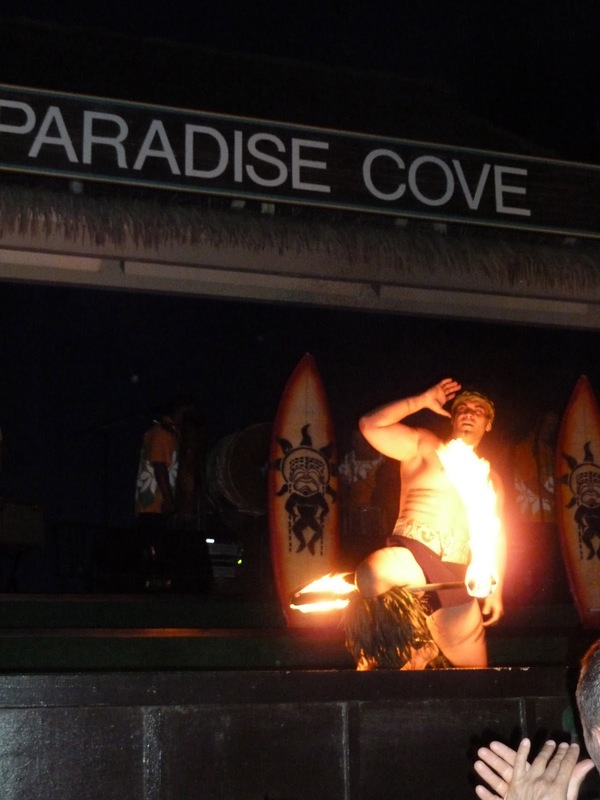 Tonight is our luau at Paradise Cove and I knew that he was going to need something and a wheelchair was out since the luau is on the beach. I had the nicest cast member, Paul, help me. He spent 40 minutes with me calling every store on the island he could think of. He even talked to another cast member about it who was going to go home and get us his set, since he was the same height, but he had no idea where they were and if he still had them. I was blown away by the effort he put. If it wasn't Sunday, they would have had their contact bring us crutches immediately with free delivery. Ugh. So after 40 minutes of phone calls he found a store that had one set left and would not hold them for us. He gave me the address and told me it was about 20 minutes away. Great. No food stop for Lisa. I nearly ran back up to the room, got gimpy and then headed for the car. Crap. I have to drive. I wasn't thrilled with this plan since, as you're seeing, I have anxiety issues and driving in an unknown area in a new car is a big trigger for me. So I gave Matt the rules, "Speak when spoken to" and "Don't give me advise about driving, it'll only make it worse.". In my head I gave myself a little pep talk and then off we went. The drive wasn't too bad. We were mostly on the highway we've gotten familiar with. We got there in about 20 minutes and the place was crazy. We thought it was best to send Matt in since parking was going be an issue. I circled until I finally found a spot and waited for his call. 15 minutes pass and nothing...this can't be good. Finally my phone rings. It's Matt. They guy didn't read the height on the one set even though the cast member specifically asked him about the heigh. So no crutches. I was so mad. Then I look at the clock, it's 2pm. We have to eat, get back to the resort, shower and get dressed and give extra time for Matt to walk to the car, since now we were drive next door to our luau, since walking there was now definitely out. So Matt gets back to the car with a brace and a candy bar for me. Isn't he sweet? Stopping for lunch was out, so we hightail it back to the resort. We got ready and ended up getting to the luau at 4:50pm- 20 minutes late. We didn't miss anything and actually, I think it helped us get even better seats. We were right next to the stage. Perfect! Matt was really hurting and I really didn't know what to do. 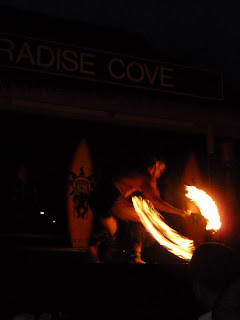 I tried to have him walk as little as possible, but it was hard since the pre-luau activities are so far apart. Finally we got to our seats for dinner and it began to rain. Awesome. 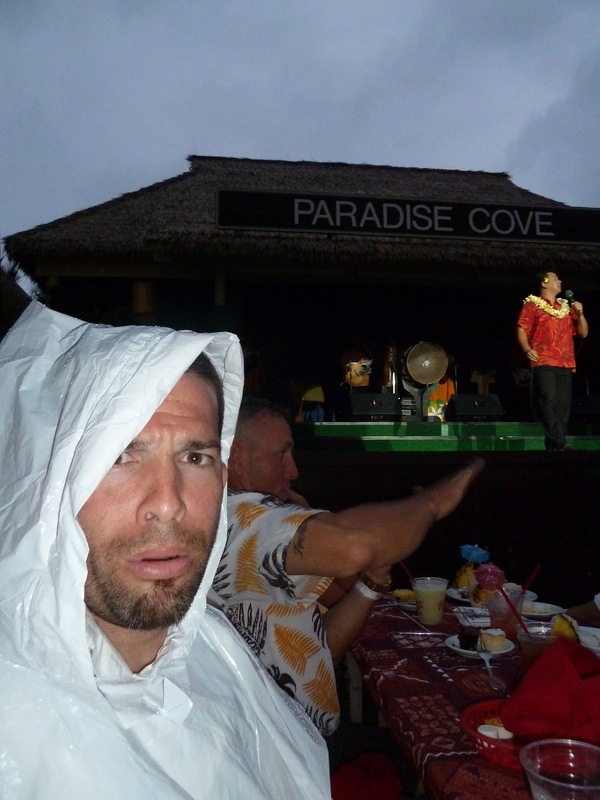 Paradise Cove doesn't cancel a show, they just hand out ponchos. Thanks. So we spent the evening sitting in the rain in ponchos at "Paradise" Cove. I was so frustrated I almost left three different times. I think Matt had a better attitude than I did, but we made the best of it and still enjoyed ourselves. We'll laugh at the memory some day. Literally, if it had to rain our entire 15 day vacation, this is the ONLY bad day and of course it's the one abnormal rainy day they had. Strategically placed lei to cover up a too low cut dress. 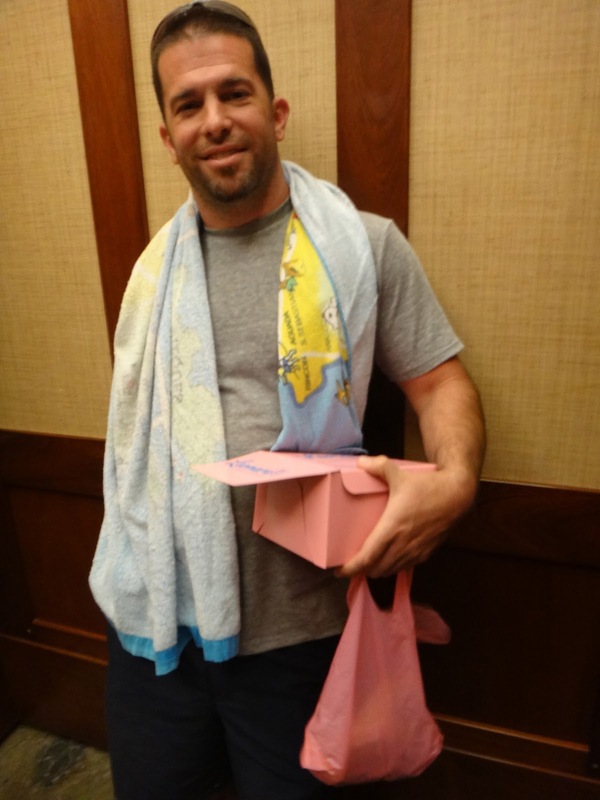 After the luau, we got back in the car and drove the 2 minute drive back and then I helped Matt all the way back to the room. We had wanted to go in the hot tub, but we thought that was probably worse for his knee. I had also planned to surprise Matt with the special stargazing offered at the resort, but that wasn't happening in this monsoon. So we just went to bed hoping that tomorrow, our first wedding anniversary would give us something to smile about. I am reading this on Monday night...so I already know what Monday will be like...Im so sorry you guys!!! !